Anna Tide, though originally from Moscow, Russia, currently resides in Germany where she studied social work at the University. "But sociology isn't my vocation. My vocation is all that I can make by my hands." Her hands are always busy with something. Anna's artistic talents started in her childhood with drawing and then in 2008, she discovered the world of artist dolls which lead her to teddy bears a short time later. 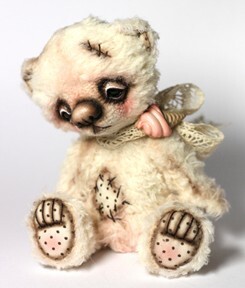 "The first artist bear I ever saw was in a collection of the doll maker I visited. This bear was a magical personality and it was not similar to anything I'd seen before." Because she was living in Germany, there were no problems in ordering the materials, so she decided to try and make a teddy bear herself. "Why not?" she originally thought. After the first bear, she told herself that she would never repeat the experience because the work was very hard, difficult and her hands hurt. "But the bears were stronger than me! They decided that I'm just the right person who should help them to be born. I think sometimes that I am nothing more than a gate which my creations use to come into the world." Teddy bears have helped Anna discover new friends and people with similar interests from around the world. Her use of the Internet is a very integral part of her life too. "I like to take photos and share my vision of the world with other people," she remarked. "My bears and dolls are a huge part of my world. Because of the Internet, people who know what I do and want to share in it, find me by themselves." But because it takes a lot of time, she stays active in communication with International teddy bear communities, but does not do a lot of social networking because she doesn't have the time for it. Though her native language is Russian, she speaks German and English. Due to the fact that she is living in Germany, she also has wonderful opportunities to not only visit the biggest German Teddy Bear exhibition, but the major European shows as well. "I would never send my bears to the exhibition alone. I think that nobody can take are of my "children" better than I can do it." Each bear is a true one-of-a-kind. Anna never keeps patterns which have already been used because she is always interested in creating new ones. "All of my creations, I do with my own hands. Starting from patterns and outfits, down to their accessories. Even the flowers that you see on my works, I make by myself." The other hobby that she has become proficient in are the Asian ball-jointed dolls (ABJD). "I do professional painting of these dolls, sew the clothes and take photographs of them. The dolls taught me to make things better and better, for example: the clothes." Everything related to ABJD is very detailed and must be done with great care. Now Anna is combining her love of dolls and bears into a new creation that she calls Teddy-dolls. "They are the creatures with human faces which I sculpt and paint by myself, and they have the bodies using teddy bear technology. I think they are like the children wearing the costumes at the fancy ball." And although she is sure that her "children" have to eventually leave her for their new home, each new creation she likes more than the one before, honing her skills and making each one better. "So I let my children go away from me, to new homes, when they are the best to me. Then I know that they will give great pleasure to the collector."